Why Be Curious? The top single-vineyard Barbera from traditional Barbera d’Asti specialist Scarpa in the Monferrato. This is the wine that helped put Scarpa on the map when Mario Pesce first conceived of making a serious, age-worthy Barbera d’Asti in the 1960s. La Bogliona continues to show that Nebbiolo is not the only Piemontese variety that’s capable of making great, long-aging wines. Vigna / Vineyard: Poderi Bricchi is Scarpa’s 50-hectare estate vineyard area in Castel Rocchero, in the heart of the Monferrato. 27 of the 50 hectares are planted with nine grape varieties that produce 11 wines. (Scarpa also sells off some grapes.) The remaining 23 hectares are forests and fields, which Scarpa deliberately leaves unplanted in order to maintain biodiversity and healthy vineyards. Vineyard treatments are copper and sulfur. The part of the vineyard from which La Bogliona comes has a high proportion of sand (~40%) and magnesium, which together give perfume and elegance. 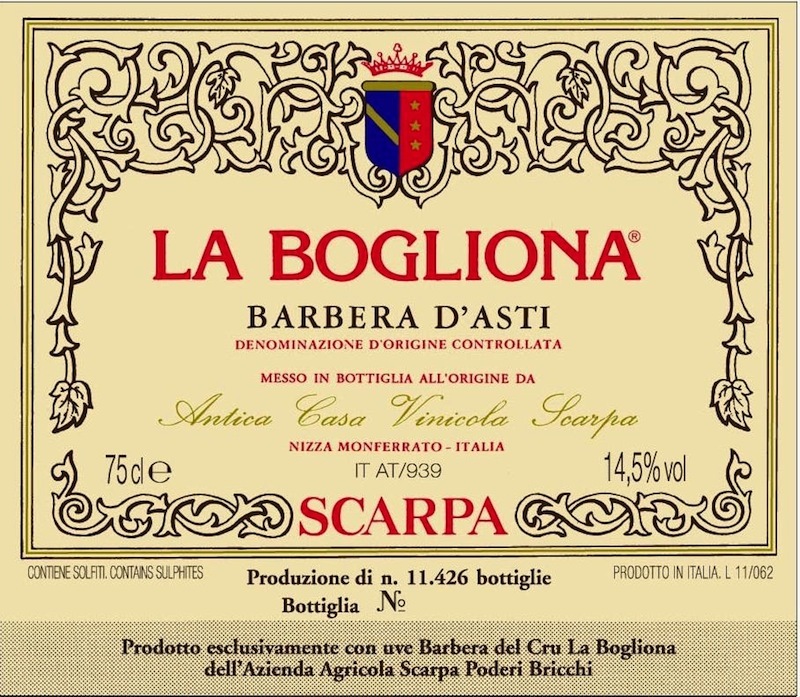 Scarpa calls La Bogliona “the daughter of sand”, as opposed to their other single-vineyard Barbera, I Bricchi, “the daughter of clay”. Cantina / Cellar: Scarpa takes the same care with La Bogliona that they do with their Barolo and Barbaresco: Traditional fermentation in large, old truncated conical wooden vats. Aging for two to three years in large casks (2,000-10,000 liters) and then at least several more years in bottle before release. Il Vino / The Wine: Here in the U.S., we tend to think of and drink Barbera as the exuberantly fruity and tangy, jack-of-all-trades everyday wine for pizza and pasta. La Bogliona shows the other end of the spectrum; it’s as good as Barbera gets. Although Scarpa releases the wine with plenty of age, good vintages will continue to improve for years. A Tavola… / At the Table… A powerful, complex, aged wine that deserves the same respect as the great Nebbiolo-based wines of Piemonte. Drink it from a Burgundy glass or other large, broad stemware to fully enjoy the aromas. Good pairings include stronger meat-based second courses. It’s also a worthy vino da meditazione at the end of a meal, with a generous hunk of aged cheese such as Parmigiano Reggiano. Suoli / Type of soils: High percentage of sand and magnesium. Età delle viti / Vine age: Mostly planted 1978; some parts replanted 2001. Fermentazione alcolica / Alcoholic fermentation: In large, truncated conical wooden tanks. Élevage: Two to three years in large French oak casks (botti grandi) ranging from 2,000 to 10,000 liters and from three to 12 years old, plus at least two more years in bottle before release. Gradazione alcolica / Alcoholic %: 14-14.5%.